The premise is right there in the title: our sixteenth president spent his off hours hunting down and destroying vampires. The book is presented as a new biography of Lincoln, based largely off a set of his secret journals. I never would have bought this book, or might not have ever read it, if I hadn't gotten it as a Christmas present. I read Pride and Prejudice and Zombies when it first came out and ended up not particularly caring for it. Turns out my first instinct was right. My issue with Grahame-Smith's genre-making Pride and Prejudice and Zombies was that the original material was nowhere near as good the classic. By the halfway point, I found myself wanting to skim over the zombie/ninja action and just read Austen's own work. Surely, something is wrong when I want to skip zombies. And to my complete lack of surprise, I found the exact same thing here. See, Abraham Lincoln was genuinely an awesome guy. Enough so that, when a book tells me that he was a vampire hunter, too, I can say, "Sure, that works." 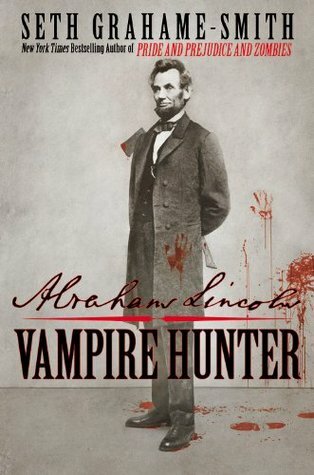 The problem here is that the vampire hunting action just isn't as interesting as Lincoln in real life. And once again, I found myself wanting to skim the original, vampire-filled material so I could get to the actual biographical details. Yes, it's a tall order to fill, to write a fictional book that can live up to Lincoln's improbable and fascinating life, but it seems Grahame-Smith just wasn't up to the task. It might have helped if he could decide whether he wanted to write a straight historical novel, an historical novel in the style of a journal, or a faux-biography. I got the impression that he had originally wanted to write the book entirely as a journal (I'd guess that 20-35% of the book is purely Lincoln's journal entries) but decided that he wanted to include outside information. Probably the best way to do that would have been as a heavily annotated journal (which would have kept up the illusion that this was based on an old document), but instead we have this odd mishmash, where on the same page we can have journal entry, faux-academic biography, and pure historical fiction. I was not satisfied with the ending. It simply didn't read true, knowing what we did of the characters at that point. I can't say much without heavy spoilers. But I think I can say that one of the main character makes a decision that is entirely at odds with what I would have expected him to do, something that I would have expected to cause a lot of hurt and angry feelings. And as far as I can see, it didn't. Like I said, it just didn't read like something that would happen. Parts of Abraham Lincoln: Vampire Hunter did end up being interesting to read, but that was almost entirely nothing to do with Grahame-Smith. I would have been much happier to read a good biography of Lincoln.